The Lair of Filth: Exclusive Track Stream and Release Information - Jyotiṣavedāṅga - Cannibal Coronal Mass Ejections. In October 2016 Cyclopean Eye Productions brought us the debut release from Jyotiṣavedāṅga, another mysterious entity with roots in both India and Russia. The release, Cannibal Coronal Mass Ejections, was initially released on digital formats along with an extremely limited cassette version, of which only 85 copies were ever made. On the 5th of May Cyclopean Eye Productions is set to release a CD version of Cannibal Coronal Mass Ejections which, along with featuring a new mix of the tracks also features a new track in the form of "Disintegration to Absolute Void." The band's name comes from the Jyotiṣavedāṅga or Vedāṅga Jyotiṣa, which is one of earliest known Indian texts on astronomy and astrology. Cyclopean Eye Productions describes the band as, "an esoteric Indo-Russian ensemble with a morbid inclination to collapsing galaxies, inter-stellar chaos and hostile extraterrestrial expropriation. Influenced one part by harsh entities like Nyogthaeblisz, Axis of Advance and Konflict, the other side reflects the ominous dark sounds of Darkspace, Mz 412 and Lustmord." The Lair of Filth is extremely proud to bring you two tracks from this quality release - the first is "Infinite Hypernova Collision" which has never been streamed elsewhere and as such is an exclusive for us, the second track is "Great Annihilator." 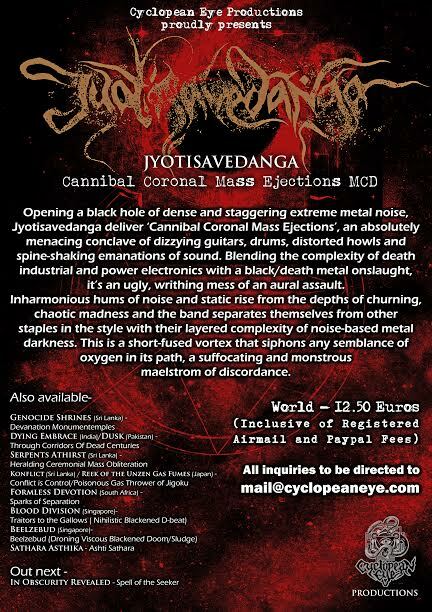 Cannibal Coronal Mass Ejections by Jyotiṣavedāṅga is due for release from Cyclopean Eye Productions from the 5th of May. Full details of this and other releases from the label are detailed in the flyer above. All enquiries to mail@cyclopeaneye.com.